Ryan Giggs has responded after Zlatan Ibrahimovic was critical of the Man Utd Class of 92 for ‘complaining all the time’. With several of the stars from that memorable era now moving into punditry work, the likes of Gary Neville and Paul Scholes have undoubtedly been vocal as the Red Devils have struggled. Particularly under Jose Mourinho, they didn’t hold back in their respective roles on the likes of Sky Sports and BT Sport, and clearly Ibrahimovic isn’t a great fan of their ongoing criticism due to their connection with the club. “They are not there anymore,” he told The Mirror. “They are on TV and complaining all the time because they are not active in the club. However, Giggs has responded with a brilliant comeback, as ultimately few would surely argue against the fact that the players of that generation are Man Utd fans and will have their passionate opinions and views on matters at Old Trafford. 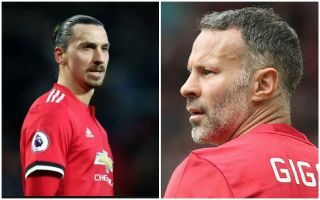 Whether it’s being asked for their opinion as part of their job or not, they have the right to be honest and up front with those beliefs, and Giggs has made that point when asked to address Ibrahimovic’s swipe. “When you play over 3,000 games between us, we’re going to have an opinion,” Giggs said, as per the Manchester Evening News. “Sometimes positive and sometimes negative but I don’t think that has any bearing on results. “We’re supporters of the club together with other ex-players who are on TV or radio – that’s what football is about, having different opinions. It’s difficult to disagree with Giggs on this one, as while constantly moaning about United probably doesn’t do anyone any favours, when the likes of Scholes and Neville criticise the current crop, it’s easy to see that they’re doing so from the heart and simply want to see United flourish. As with any fan, pundit or ex player, we all have the right to an opinion, and Ibrahimovic hasn’t been shy sharing his own over the years either. "Obviously he knows more about the club than us" ? Ryan Giggs responds to Zlatan Ibrahimovic's claims that ex-players have too much of an influence at #MUFC.